A blood clot in the lung is known as a pulmonary embolism. There is often confusion among patients as to the exact location of the clot – despite being commonly referred to as a blood clot in the lung, the clot is not within the air spaces of the lungs. Instead it is lodged in the pulmonary artery and impairs the gas exchange that occurs between the air spaces and blood stream since blood flow is drastically slowed or stopped. The oxygen supply to the lung tissue (parenchyma) is also compromised and can lead to an infarct. An embolism means that the blood clot developed elsewhere in the circulatory system, dislodged and then traveled to the site where it is now causes an occlusion. This blood clot is referred to as an embolus (plural ~ emboli). Clots in the pulmonary vessels can also occur in-situ meaning that it arises within these vessels and did not travel from elsewhere in the circulation. This is known as pulmonary thrombosis but is less common than a pulmonary embolism. The blood clot that forms at the site is known as a thrombus (plural ~ thrombi). These conditions are broadly encompassed under the term venous thromboembolism (VTE) involving the pulmonary vasculature. The problem often stems from the leg veins (deep venous thrombosis / DVT) and then embolizes first to the popliteal veins and eventually lodges in the pulmonary artery. It has to be remembered that although the pulmonary artery is named as such, it carries deoxygenated blood to the lungs. Almost every other artery, except the umbilical arteries, carry oxygenated blood to the tissues while veins carry deoxygenated blood back to the heart and lungs. 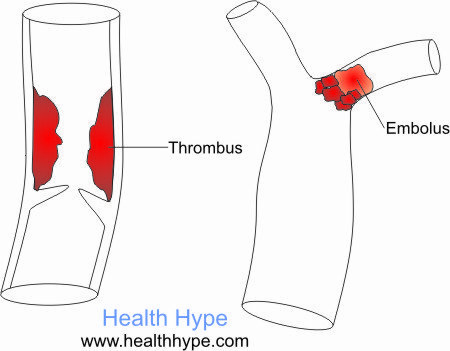 Emboli and thrombi are more likely to affect the veins, although the arteries may be involved especially when a thrombus lodges in an artery already narrowed by an atheromatous plaque (atherosclerosis). In terms of pulmonary embolism though, the focus of the cause should first lie with the deep veins of the legs. The three factors (Virchow’s triad) that contributes to thrombus formation includes endothelial damage, hypercoagulability and alterations to blood flow. This is also discussed further under venous insufficiency of the legs and blood clot in the leg. Once a thrombus develops in the legs, there is always the risk that it may break away (embolize) and lodge anywhere in the venous system. Sometimes the embolus may not be a clot but rather a globule of fat, amniotic debris, piece of a tumor or atheroscleortic plaque. It will pass through the larger veins and in the case of pulmonary embolism, even through the right atrium and ventricle of the heart, to then obstruct the pulmonary arteries and capillaries. When thrombosis occurs in-situ within the pulmonary arteries, meaning that the clot forms at this site rather than traveling from distant sites, there is usually underlying disorders like heart failure, pulmonary hypertension or pulmonary atherosclerosis. These conditions contribute to thrombosis in the same way as within the leg. The clinical presentation of a pulmonary embolism depends on multiple factors. If there is a large blockage like with the main pulmonary artery or one of its main branches, then sudden death may occur. This is known as a massive pulmonary embolism. A small to medium pulmonary embolism may not be as critical but can still result in hemorrhages or a pulmonary infarct. In these cases, the clot breaks up and lodges in the peripheral vessels or capillaries but an alternate blood supply from the bronchial artery can sustain the lung parenchyma. The signs and symptoms of an acute massive, medium or small pulmonary embolism may overlap to a certain extent. It is always considered as a medical emergency but red flag signs and symptoms should warrant the need for immediate attention.